Firesara:More fun for life! More fun with swimming ! Firesara high quality swimming cap is specially designed to solve all the potential problems. The extra nose clip and ear plugs will offer further protection for you. It suits both young people as well as adults with long hair, protecting your hair from the harmful substances in the water. The unique 3D ergonomic design makes it easy and quick to take on and off without snagging hair and keep the water out. 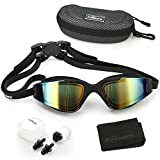 It can protect your hair and ears and makes your swimming more enjoyable. Firesara swim cap for both recreational and competitive events from regular swimming to synchronized swimming, water polo etc. Swim Cap + Nose clip + Ear Plugs -NEW MATCH to redefine your SWIMMING EXPERIENCE. 1.100% top-class silicone, eco-friendly, non-toxic and odorless. 3.With elastic that makes getting on and off easily without snagging our hair. 4. Prevent chlorine from contacting our scalp and hair. √ Original 3D ERGONOMIC DESIGN-Our swim cap is shaped once according to the shape of a human skull. The 3D ergonomic design makes a more comfortable fit. It is easy and quick to take on and off while not snagging hair. 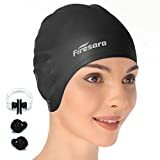 Firesara swim cap for both recreational and competitive events from regular swimming to synchronized swimming, water polo etc. Come first in your swimming competition, as it increases your speed in water. √ EAR PROTECTION, HIGH-QUALITY SILICONE-Professional ear protection design can give your ear futher protection and keep ear dry. Different to other swim caps, our swimming cap ismade from high-quality silicone. It is wrinkle-free, odorless and elastic. The thick margin of the cap makes it more durable and elastic. 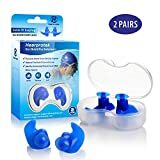 √ PERFECT GIFT FOR SWIM ENTHUSIASTS-Our swim caps have professional nose clip and ear plugs sets. The extra nose clip and ear plugs will offer further protection for you. You won’t have to think about overpressure or water getting into your ears or nose. A professional set with elegant package, it is a good choice to be a nice gift. √ ONE SIZE FITS ALL-Our swim cap is suitable for various persons as kids, adults, men, women, boys, girls etc, because of its unique 3D ergonomic silicone design. The cap fits well, and is easy to keep the water out. It can prevent hair damage from the chlorine and has UV protection without odor and toxicity. √ LIFETIME WARRANTY-We guarantee satisfaction or your money back, no questions asked, on top of that, Firesara swim cap, nose clips, and ear plugs all come with lifetime warranty. We know you have a lot of options and we just want to be your right choice. NOTE: To protect the swim cap form scratches or getting ripped, please keep it far away from fingernail, rings or other sharp objects.